Drowning in debt? Can't pay your bills? Are you behind on your mortgage? Is the mortgage company threatening to foreclose? Are creditors harassing you with phone calls? Are they threatening to repossess your car? To many people bankruptcy is frightening and the changes in the Bankruptcy laws have made filing for bankruptcy more difficult, but you can still get the fresh start you need. No one wants to file for bankruptcy, but sometimes it's the only answer. 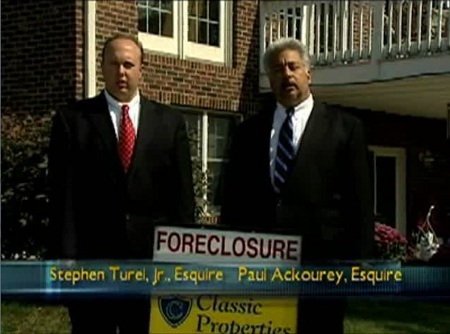 At Ackourey & Turel, we can help you save your home. We can stop the harassing phone calls and most importantly, give you a fresh start and peace of mind. So call us and let us answer your questions about bankruptcy. Chapter 7 and Chapter 13 are the two principal types of Consumer Bankruptcies. Whenever a person incurrs debt that he or she cannot pay, filing for Bankruptcy may provide financial relief. At Ackourey & Turel P.C., our lawyers have helped individuals obtain a fresh start through the Bankruptcy process. An individual who files for Bankruptcy relief is called a debtor. In a Chapter 7 Bankruptcy, the debtor flies a petition with the Federal Court. A Trustee is assigned to represent the creditors. The goal in a Chapter 7 Bankruptcy is to have as many of the debtor's assets covered by an exemption and obtain a discharge releasing the debtor from having to pay these debts. If assets are not covered by an exemption the Trustee may sell the asset at a court administered sale to satisfy some of the debts. A Chapter 7 Bankruptcy is the most common type of Consumer Bankruptcy. In a Chapter 13 Bankruptcy, the debtor files a petition with the Federal Court. A Trustee is assigned to represent the creditors. The debtor pays the Trustee through an installment plan each month. The Trustee then forwards these payments to the creditors. Many types of debtors file under a Chapter 13 Bankruptcy. A debtor can prevent a repossession of an automobile or prevent a foreclosure on their home or real estate. The installment plan generated allows debtors to catch up on arrearages in order to keep the collateral. The installment plan usually lasts 3 to 5 years.